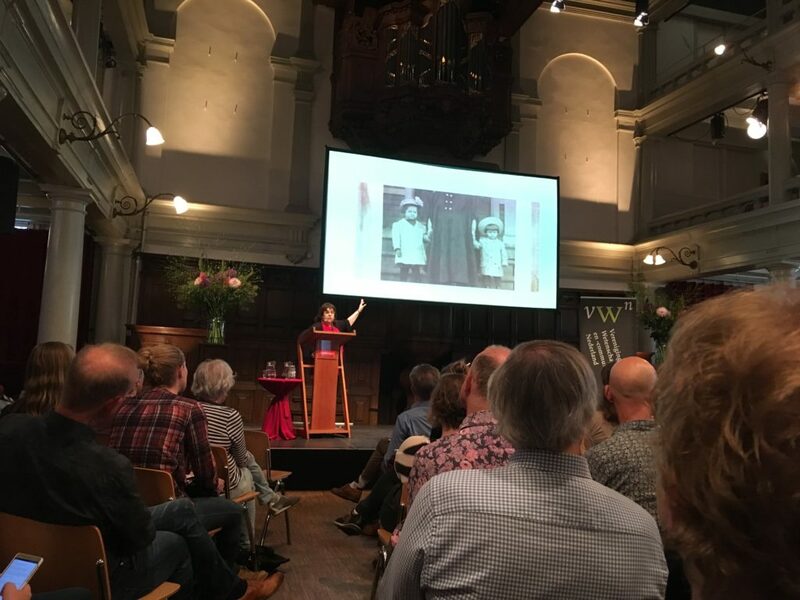 I took a four hour train journey, involving a passport check and a train change in Belgium, but it was worth it: I travelled from London to Amsterdam to attend Bessensap, a Dutch science communication conference. This is a one-day annual event, bringing together scientists, journalists, press officers and science communicators. The name Bessensap literally means “berry juice”, prompting many questions from my Dutch friends. Why is a science meeting called “berry juice”? The name originated from a silly Dutch poem, in which a scientist drinks cement “for science”, after which his wife urges him to at least have some berry juice. The funny name does set the tone for the whole event. Like most other science communication meetings I’ve been to, it was super friendly, and there was plenty of opportunity to chat to people. I don’t know that many people in Dutch scicomm, and that was one of the main reasons I wanted to go. I left the Netherlands in 2002, and even though I was interested in science communication at the time, I wasn’t actively involved in the community yet. Now that I am, I know plenty of other science communicators in the US, Canada and UK – even some in Australia – but almost nobody in Holland. It was about time I met my Dutch colleagues! I live-tweeted most of the day. That was even more challenging than I normally find live-tweeting, because most of the talks were in Dutch, and my tweets are in English. For a much better summary, the organisers produced this short video about the day. The first talk of the day was a keynote lecture by science writer Deborah Blum, about trust in science journalism. Filled with exciting stories of poison and chemicals, Blum’s keynote was a lively take on trust in the media. She inspired many of us to think more about our audience, and the methods we use to connect with them. Bessensap took place in meeting and debate centre De Rode Hoed, along one of Amsterdam’s central canals. 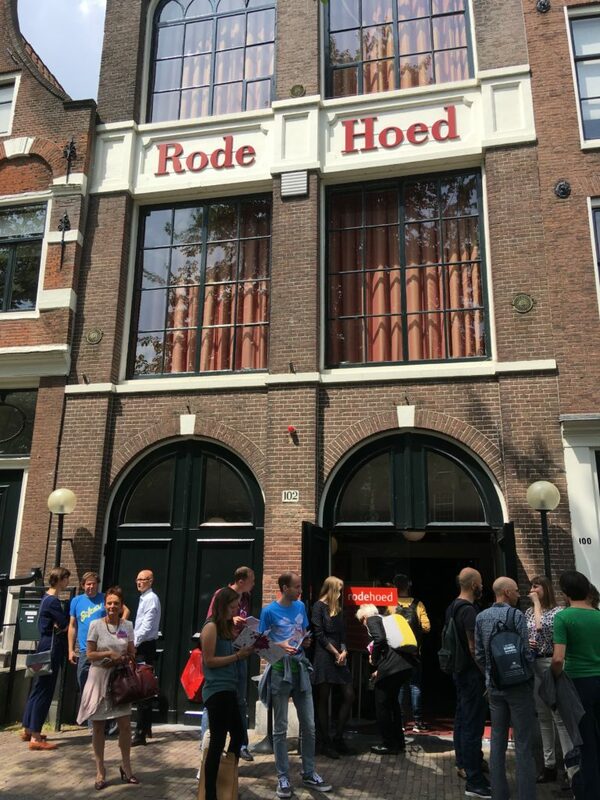 It’s a beautiful old building, but not quite large enough to host hundreds of science communication experts in five parallel sessions. 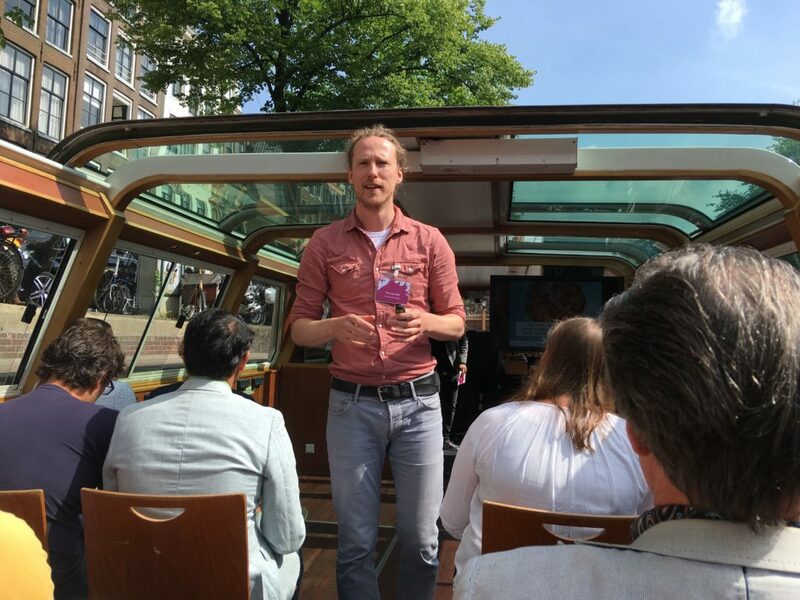 In true Amsterdam style, the solution is obvious: turn a moored canal boat into one of the lecture rooms! Here I listened to Tim van der Zee talk about “sloppy science”, followed by a talk by Liza Cornet, who is developing a virtual reality game to get criminals to think about their future self. This conference also marked the official announcement of this year’s winners of the Spinoza awards and the (new) Stevin awards. These top awards for Dutch scientists come with a gift of 2.5 euro, which the recipients can spend however they like. You can find the winners on the NWO website. 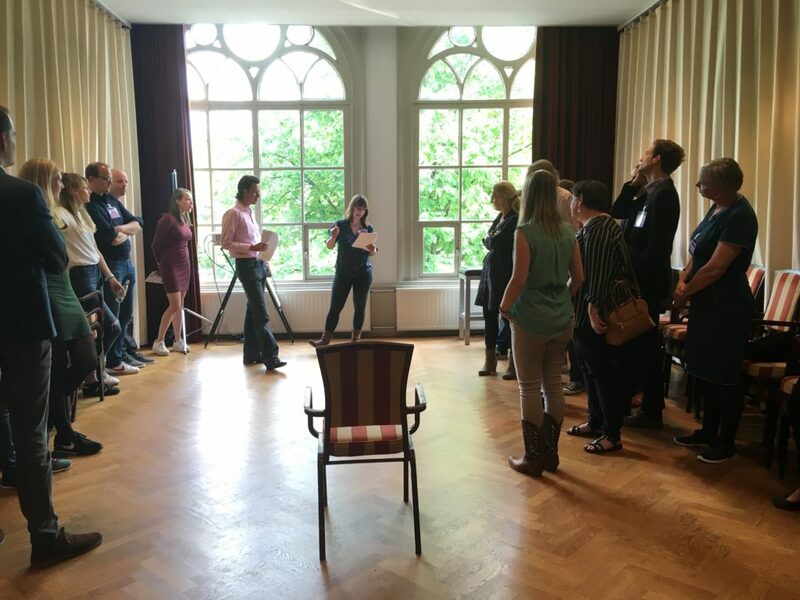 One of my favourite events at Bessensap was a quick-fire elimination science quiz in which anyone could participate. Called “Vakkennis”, the name is a play on the word for expertise (vakkennis), which literally means “knowledge of a field” – and the fields here were areas marked off in the room where the quiz took place. Each question had four possible answers, and to indicate your answer you had to stand in the correct field within 3 seconds. You can see where everyone else is going, but the funny thing about this game is that the majority is not necessarily right! We played through four rounds of the game, and every time a huge chunk of people (including me) would be eliminated all at once because we collectively stood in the wrong field. I’d love to play Vakkennis at one of the scicomm events in London some time (and I’ve already decided it should be called “Areas of Expertise” to maintain the wordplay). If not, I suppose I’ll just have to go back to Bessensap again next year. Listening to music helps you study – or not?